"If a single, well verified mammal skull were to turn up in 500 million year old rocks, our whole modern theory of evolution would be utterly destroyed": (Quote: Richard Dawkins). This contentious group of anomalous artefacts includes anthropomorphic discoveries which have been found in geological strata formed before humans are believed to have existed. At present, all the following artefacts are classified as 'anomalous' or 'fake'. Should just one of these discoveries ever be verified by the scientific establishment, it would force a reappraisal of either the processes of geology or the theory of human development. 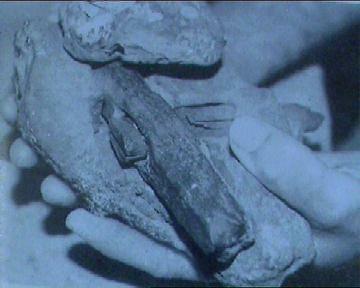 This fossilised hammer (right) was found embedded in a rock. It was displayed in 2000 and is verified as authentic but what exactly does it tell us. The fossilised 'London Artefact' has gained notoriety in recent years following its display in an exhibition of anomalous artefacts in the year 2000. It is a perfect example of the anomalous nature of some archaeological discoveries. On the one hand, we are presented with a hammer, clearly of human design; While on the other hand, it is embedded in a rock found in a region formed of predominantly cretaceous rock. The sandstone, within which the hammer has become embedded was dated by dr. A. W. Med of the British Geological Research Centre. The Hammer is identical to commonly used 19th century miners hammers, of American provenance. The stone is real, and it looks impressive to someone unfamiliar with geological processes. How could a modern artefact be stuck in Ordovician rock? The answer is that the concretion itself is not Ordovician. 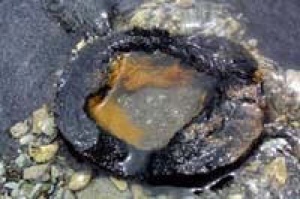 Minerals in solution can harden around an intrusive object dropped in a crack or simply left on the ground if the source rock (in this case, reportedly Ordovician) is chemically soluble (Cole, 1985). Chains in Coal: Workmen quarrying stone near the River Tweed below Rutherford, Scotland in 1844, found a piece of gold thread embedded in the rock of the quarry eight feet below ground level. A small piece of the thread was sent to the offices of the local newspaper, the Kelso Chronicle, "for the inspection of the curious." Iron Nails: In 1851, Hiram de Witt, of Springfield, Massachusetts, accidentally dropped a fist sized piece of gold bearing quartz that he had brought back from California. The rock broke apart in the fall, and inside it de Witt found a 2" cut iron nail, slightly corroded. "It was entirely straight and had a perfect head," reported The Times of London. 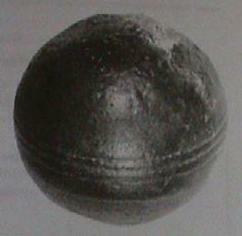 A nail partially embedded in a block of stone taken from Kingoodie quarry in Scotland was described at a meeting of the British Association for the Advancement of Science in 1845, Sir David Brewster, who gave the report, said that about an inch of the nail was embedded, the rest lying along the stone and projecting into a layer of gravel, where it had rusted. 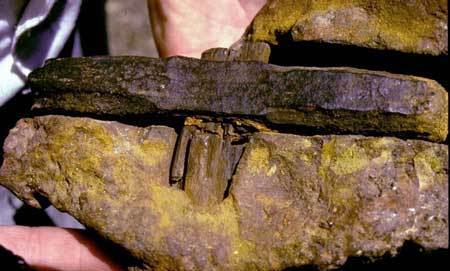 The depth from which the 9" thick block of stone bearing the nail had been removed is not on record, but the quarry was said to have been worked for about twenty years prior to the discovery. An "iron instrument" apparently resembling the bit of a coal drill, was found inside a lump of coal taken from an excavation in Scotland in 1852 (Scotland again!). It was at first supposed that a miner had broken his drill while working the seam and had left the piece of metal embedded there. But the surface of the coal was unbroken: it showed no signs of drilling or any present or former opening by which the drill might have passed into it's interior. If such a thing were not quite impossible, according to every date in the geology text books, observers would have to believe that the coal would somehow have formed around the mysterious piece of metal. Extensive quarrying was done near the city of Aixen -Provence, France between 1786 and 1788, to provide the large quantities of limestone needed for the rebuilding of the Palace of Justice. In the quarry from which the limestone was taken, the rock strata were separated from each other by layers of sand and clay, and by the time the workmen had removed 11 layers of rock they had found they had reached a depth of some 40 feet or 50 feet from the original level of the area. Beneath the 11th layer of limestone they came to a bed of sand and began to remove it to get at the rock underneath. But in the sand they found the stumps of stone pillars and fragments of half worked rock, the same stone and rock that they themselves had been excavating. they dug further and found coins, the petrified wooden handles of hammers, and pieces of other petrified wooden tools. Finally they came to a large wooden board, seven or eight feet long and an inch thick. like the wooden tools, it had also been petrified into a form of agate and it had been broken into pieces. When the pieces were reassembled, the workmen saw before them a quarryman's board of exactly the same kind they themselves used, worn in just the same way as their own boards were, with rounded, wavy edges. How a stonemason's yard equipped with the kind of tools used in France in the late18th century, had come to be buried 50 feet deep under layer of sand and limestone 300 million years old is a question even more vexing today than at the time of the original discovery. For we now know, thanks to advances in geological and anthropological dating, that such a thing is absolutely impossible. And yet it does seem to have happened. At least 200 have been found, and extracted out of deep rock at the Wonderstone Silver Mine in South Africa, averaging 1-4 inches in diam. and composed of a nickel-steel alloy that doesn't occur naturally. Some have a thin shell about a quarter inch thick, when broken open are filled with a strange spongy material that disintegrates into dust upon contact with air. The following is an extract from a letter. (Apparently from a NASA scientist) : Unconfirmed. 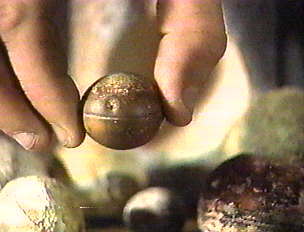 'The existence of the sphere came to my attention ca 1977 while removing endangered rock engravings from the site where pyrophyllite or "wonderstone", as it is commonly known in the region, is mined on the farm Gestoptefontein (meaning plugged fountain) near the little village of Ottosdal about 110 km from Klerksdorp in South Africa's Northwest Province. I was intrigued by the form of the spheres, grooves around the middle and the fact that they are as hard as steel, while the material (pyrophyllite) in which they are found, is as soft as limestone with a count of only 3 on the Mohr scale. As you probably know, pyrophyllite (Al2 Si4 O10 (OH)2) is a secondary mineral and the deposits were formed by a process of sedimentation. On Gestoptefontein volcanic activity was responsible for the forming of outcrops varying in height from about 10 to 100 meters. The smooth and relatively soft surface on the slopes were ideal for the prehistoric dwellers (San) to make their engravings of animal and abstract designs. On Gestoptefontein these outcrops were "sawn" into huge pieces by means of twisted steel cables running zig-zag on pulleys for several kilometres. These blocks were then sawn by the same method into more manageable pieces of about 500 x 500 mm. Occasionally the "sawing cable" got stuck on one of the metal spheres embedded in the pyrophyllite. They vary in size from " 30 – 50 mm in diameter and have perfectly concentric grooves round the center as if they were molded. Inside the hard "shell" some have a spongy substance, while in others it resembles charcoal. 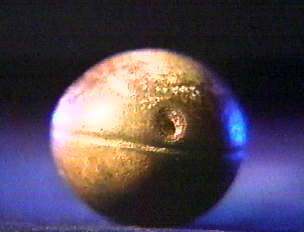 When only partly embedded so that they can be seen on the surface, they are not all spheres, but some are also oblong in form. According to Professor Andries Bisschoff of the University of Potchefstroom (retired some years ago) they are limonite concretions. Due to the relative scarcity of the spheres and the almost impossibility for outsiders to obtain samples from the mine, his conclusions have not been verified by other scientists'. This particular discoveries illustrates the way mistakes can be made. 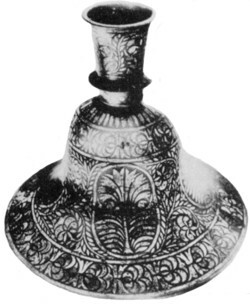 There is little doubt that what was discovered was the remains of a contemporary 'candlestick' similar to the one on the right. The story goes that rock hunters collecting geodes in Olancher, California cut a stone in half to discover a form of mechanical device. Beneath the outer layer of hardened clay, pebbles, and fossil inclusion was a hexagonal layer of an unknown substance softer than agate or jasper. This layer surrounded a three-quarter-inch-wide cylinder made of solid porcelain or ceramic, and in the centre of the cylinder was a 2mm shaft of bright metal. This shaft was magnetic and showed no signs of oxidation. Circling the ceramic cylinder were rings of copper, and these also had not corroded. 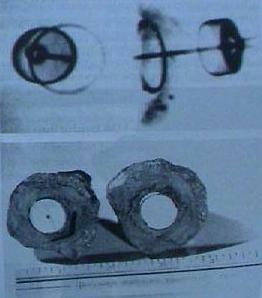 X-ray photography (right, top), showed that the metallic shaft was corroded at one end, but the other was affixed to a spring or helix of metal. (9). 1899 - Smithsonian institute initiate a survey of anomalous artefacts that 'appear to come from gravels dating 38-55m yrs from 'Table-top mountain'. Finds include: spear heads 6-8'' long, ladles and handles, notched slate object (possibly for a bow), stone grinding tool, human jaw (33-35 m yrs), Mastodon tooth, ¼ '' perforated, white marble bead, stone axe, Andesite stone mortars (nearest source 100 miles). 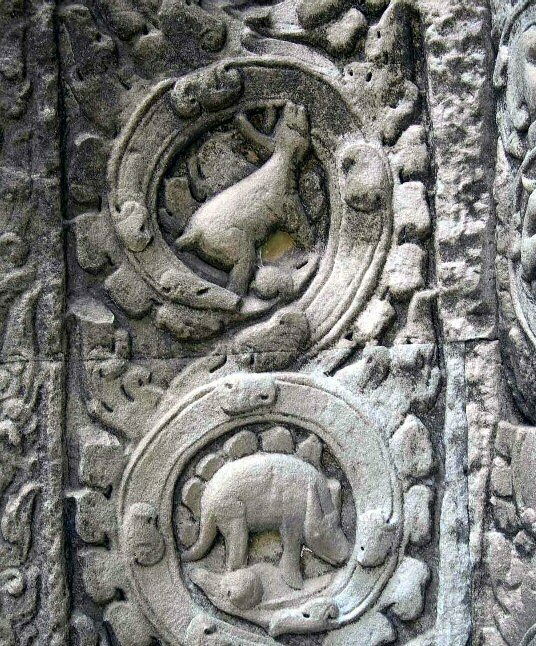 This carved facade can be seen in the temples of Ta Prohm, Cambodia. (Dated 11th Cent AD). A Close-up reveals the image of a Stegasorus. 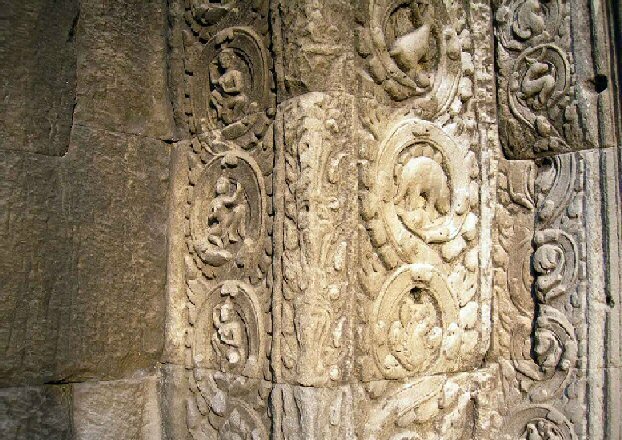 We know that it is an original carving as the depth of the relief is the same as the rest of the facade. The topic of dinosaur and human footprints side by side sends an understandable shudder down the spines of Geologists worldwide, but try as they might to turn their back on it, the subject just won't go away. Example 1: In 1983 Professor Amanniyazov, Director of Turkmenia's Institute of Geology, reported what appeared to be human footprints in Mesozoic strata. "This spring, an expedition from the Institute of Geology of the Turkmen SSR Academy of Sciences led by found over 1,500 tracks left by dinosaurs in the mountains in the south-east of the Republic. Impressions resembling in shape a human footprint were discovered next to the tracks of the prehistoric animals." (Rubstsov, "Tracking Dinosaurs," Moscow News, No. 24, p. 10, 1983.) Dr. Amanniqazov was shocked beyond belief to find a human footprint mingled with dinosaurs. He discusses one of the footprints and says: "if we speak of the human footprint, it was made by a human or a human-like animal. Incredibly, this footprint is on the same plateau where there are dinosaur tracks. 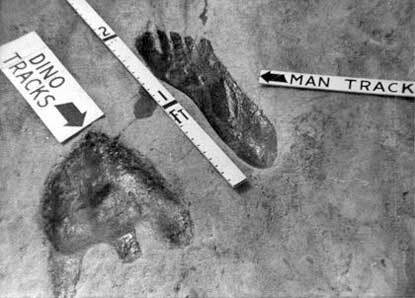 We can say the age of this footprint is not 5 or 10, but at least 150 million years old. It is 26cm long, that is Russian size 43 EEE [9.5 American], and we consider that whoever left the footprint was taller than we are...this would create a revolution in the science of man." (Amanniyazov, Kurban, Science in the USSR T 986, "Old Friends Dinosaurs," p. 103-107.) There is also this fascinating quote from the Russian journalist, Alexander Bushev who investigated these trackways: "But the most mysterious fact is that among the footprints of dinosaurs, footprints of bare human feet were found...We know that humans appeared much later than dinosaurs - that there was an extraterrestrial who walked in his swimming suit along the sea side." Example 2: The Image (right) is from the Zapata track, found in Permian limestone in New Mexico. In 1987, not far from the Zapata track site, paleontologist Jerry MacDonald discovered a variety of beautifully preserved fossil footprints in Permian strata. The Robledo Mountain site contains thousands of footprints and invertebrate trails that represent dozens of different kinds of animals. Because of the quality of preservation and sheer multitude of different kinds of footprints, this tracksite has been called the most important Early Permian sites ever discovered. 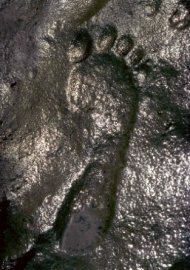 Some that have visited the site remark that it contains what appears to be a barefoot human print. "The fossil tracks that MacDonald has collected include a number of what paleontologists like to call ‘problematica.’ On one trackway, for example, a three-toed creature apparently took a few steps, then disappeared--as though it took off and flew. 'We don't know of any three-toed animals in the Permian,' MacDonald pointed out. ‘And there aren't supposed to be any birds.’ He's got several tracks where creatures appear to be walking on their hind legs, others that look almost simian. On one pair of siltstone tablets, I notice some unusually large, deep and scary-looking footprints, each with five arched toe marks, like nails. I comment that they look just like bear tracks. ‘Yeah,’ MacDonald says reluctantly, ‘they sure do.’ Mammals evolved long after the Permian period, scientists agree, yet these tracks are clearly Permian." Example 3: The 'Guadeloupe Woman' is a well-authenticated discovery which has been in the British Museum for over half a century. In 1812, on the coast of the French Caribbean island of Guadeloupe, a fully human skeleton was found, complete in every respect except for the feet and head. It belonged to a woman about 5 foot 2 inches [15.54 dm] tall. What makes it of great significance is the fact that this skeleton was found inside extremely hard, very old limestone, which was part of a formation more than a mile [1.609 km] in length! Modern geological dating places this formation at 28 million years old—which is 25 million years before modern man is supposed to have first appeared on earth! Since such a date for a regular person does not fit evolutionary theory, you will not find "Guadeloupe Woman" mentioned in the Hominid textbooks. To do so would be to disprove evolutionary dating of rock formations. When the two-ton limestone block, containing Guadeloupe Woman, was first put on exhibit in the British Museum in 1812, it was displayed as a proof of the Genesis Flood. But that was 20 years before Lyell and nearly 50 years before Darwin. In 1881, the exhibit was quietly taken down to the basement and remains there to this day. In 1987, palaeontologist Jerry MacDonald discovered a wide variety of fossilized tracks from several different species of animals and birds, located in a Permian strata. Among the various fossilized tracks were the clear prints of a human foot. However, the Permian strata has been dated from 290 to 248 million years ago- millions of years before animals, birds, dinosaurs, and yes, man, was supposed to exist. How then can these prints be explained? In July 1992, the Smithsonian Magazine had an article on these tracks called "Petrified Footprints: A Puzzling Parade of Permian Beasts". The magazine acknowledged the mystery, acknowledging "what palaeontologists like to call, 'problematic.'" It described what appeared to be large mammal and bird tracks that, "evolved long after the Permian period, yet these tracks are clearly Permian." While it is commendable that MacDonald and the Smithsonian clearly acknowledge the existence of these tracks in a strata that contradicts the current evolutionary theory, it is noteworthy that they highlight only the mammal and bird prints, and don't mention the human footprint found with them. Interestingly enough, since these tracks been discovered, evolutionists have not tried to argue their authenticity or debunk them. Nor have they tried to argue that the footprint isn't human. (Often they claim that it's a print that just "looks like" a human footprint.) Their silence is deafening. 1). M. A. Cremo & R. L. Thompson. Forbidden Archaeology. 1993. Bhaktivedanta Institute. 8). Dr. Hans J. Zillmer. Darwin's Mistake. Adventures unlimited press, 1998.